The HVAC and industrial company stock looks like a good buy for investors in 2017, particularly for those who like growth-at-reasonable-price, or GARP, investing. Given the market's exuberance about the prospect of an industrial renaissance following President Donald Trump's election victory, it's becoming harder and harder to find industrial stocks at a good value. However, Ingersoll-Rand Plc (NYSE:IR) trades at a discount to its peers and offers investors a compelling mix of near- and long-term value creation prospects. In short, it's a smart buy for investors. Here's why. It trades at a discount to its peers, particularly those that compete in the heating, ventilation, and air-conditioning (HVAC) sector, like United Technologies Corporation (NYSE:UTX) and Lennox International Inc (NYSE:LII). Improvements with working capital and productivity have led to a significant increase in free cash flow (FCF) generation. A pickup in the industrial economy in 2017 will help margin and revenue recover in its industrial segment. Its Trane subsidiary (HVAC) has been gaining market share in a competitive market -- a demonstration of a fundamental restructuring at the company. As Ingersoll-Rand's core business, Trane has a long-term opportunity to expand margins to levels of peers like United Technologies' Carrier and Lennox International. The valuation discount is best shown by charting enterprise value (market cap plus net debt) to earnings before interest, tax, depreciation, and amortization (EBITDA). The discount doesn't look justified given the impressive increases in operating margin and FCF in recent years. Moreover, management expects further progress in 2017, with the midpoint of adjusted continuing EPS guidance calling for a 6.5% increase. Meanwhile, adjusted operating margin is expected to increase from 11.9% in 2016 to a figure in the 12.2% to 12.6% range. FCF is expected to decline from 2016's elevated level to around $1.1 billion to $1.2 billion. Nevertheless, the midpoint of FCF guidance implies Ingersoll-Rand will generate around 4.9% of its enterprise value in FCF in 2018 -- not bad for a growth business. Segment operating income increased 8.8% in 2016, but the 17.2 increase in segment operating income in the climate segment masked the 21% decline in the industrial segment -- a motley collection of businesses including air compressors, material handling, and golf vehicles. Given expectations of a recovery in industrial production in the U.S. and stabilizing oil and gas markets, the industrial segment looks set for a better year in 2017. Indeed, as you can see below, industrial bookings somewhat stabilized in the latter part of 2016 -- climate bookings remain very strong. Data source: Ingersoll-Rand Plc. Chart by author. "Y on Y" = Year on Year. Given revenue and orders growth at competitors like Lennox, Carrier (United Technologies), and Johnson Controls' (NYSE:JCI) building technologies and solutions (HVAC, fire detection, security products) segment, it's hard not to conclude that Trane has been gaining market share from its rivals. For example, Ingersoll-Rand's commercial and residential HVAC orders were both up in the "low-teens" in the fourth quarter, while Johnson Controls' comparable segment orders were only up 2% in its most recent first quarter. Meanwhile, residential and commercial HVAC revenues rose 10% and 7%, respectively, for Lennox International in its fourth quarter. 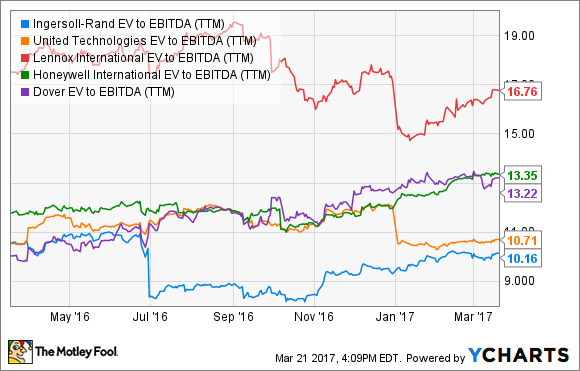 Moreover, on a recent United Technologies presentation, management talked about giving back market share in 2016 following strong gains in 2015. Ultimately, United Technologies expects to win back some share in 2017. That said, Ingersoll-Rand expects commercial and residential HVAC organic revenue to both be up mid-single-digits in 2017, while United Technologies expects residential and commercial HVAC organic sales to be up mid-single-digits and low-single-digits, respectively. In other words, Ingersoll-Rand is predicting better growth than United Technologies in commercial HVAC. Ingersoll-Rand has a long-term opportunity to expand HVAC margin to the levels reached by competitors -- particularly United Technologies. Indeed, management expects to continue to expand Ingersoll-Rand climate margin to 14.5%-15% in 2017 from 13.6% in the fourth quarter. All told, Ingersoll-Rand offers a compelling proposition to investors. The near- and long-term earnings drivers are attractive, and the stock trades at an attractive relative and absolute valuation. 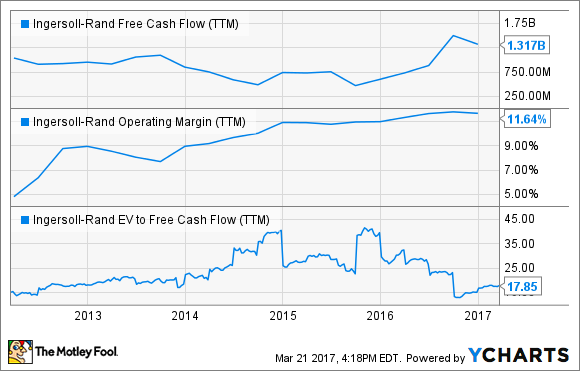 The margin improvements at Trane look set to continue, and if the industrial segment returns to some sort of normalcy in 2017, then there is upside potential. It's a good candidate for "growth at reasonable price" investors.